Rethink Refurbished! Configure our Dell PowerEdge R810 to your specific needs and get our exclusive one year warranty with it. For high-density and powerful performance, the Dell PowerEdge R810 supports up to four eight-core Intel® Xeon processors, six hard drives and 512GB high-capacity DDR3 memory. To help maximize ROI on memory technology investments, the Dell R810 utilizes FlexMem Bridge technology, allowing you to double your processor performance, without taking up your valuable data center space. 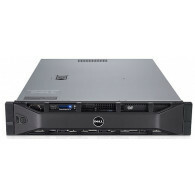 The Dell R810 features an Energy Smart design with improved airflow and venting inside the unit. These features allow you to enable power capping, regulate temperatures and monitor thermal activity, all of which will reduce your overall energy consumption by approximately 16%. *Please note four CPUs are required when configuring w/7500 series CPUs. *Please note two CPUs are required when configuring w/6500 series CPUs.